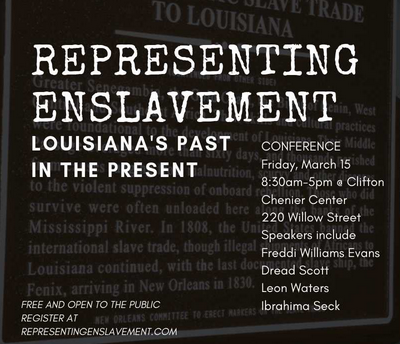 The Department of History, Geography, and Philosophy at the University of Louisiana at Lafayette will hosts a keynote & conference entitled, Representing Enslavement: Louisiana’s Past in the Present on Friday, March 15, 2019, from 8:30 am to 5:00 pm at the Clifton Chenier Center Auditorium. Admission is free and open to the public. Speakers include Freddi Williams Evans, Dread Scott, Dr. Ibrahima Seck, Leon Waters, Robin McDowell, Dr. Phebe Hayes, Dr. Jonathan Earle, and Daphne Thomas. Experts from across the state will teach the history of enslavement in Louisiana. Conference organizer Dr. Ian Beamish says the keynote presentation and conference aims to connect historians with the community, in an effort to teach the public history of enslavement in Louisiana.